It’s officially Spring, and a new season calls for a new wardrobe. With the weather getting warmer and nights getting lighter, we can already hear the BBQ’s calling. But first, you need to upgrade those garms. We’ve collated all the essentials for your Spring edit, and with fresh trends and new brands on the block, we’re bringing you pieces you’ve just got to cop. This season, all eyes are on bold, statement colours. With all our top brands going loud and proud this season, these lines are oozing with standout flavour. Earlier this month PUMA dropped their latest XTG collection. Back from the ’90s, the reissued XTG range takes cues from old school Cross Training Gear. Catch Romelu Lukaku reppin’ this XTG Crew Sweatshirt and layer up it up with the matching XTG Woven Jacket for an added burst of standout colour. This men’s Air Crew Sweatshirt from Nike is always an essential. Makin’ sure all eyes are on you, this sweatshirt can be repped from the sofa to the streets. Feeling brave? Match them up with these Nike Tape Track Pants for added urban edge! 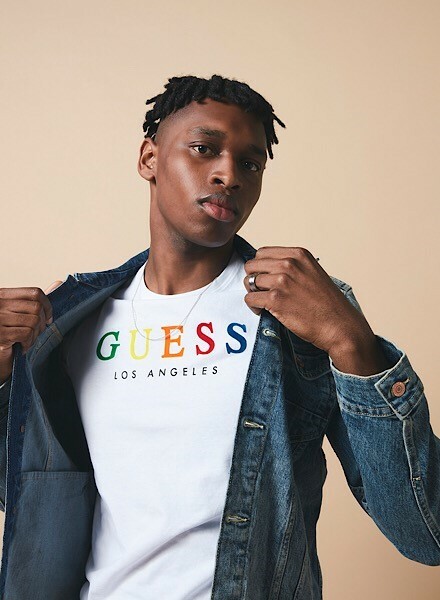 Keepin’ your look on lock, GUESS has landed at JD. With the likes of A$AP Rocky, Don Benjamine and Frank Ocean reppin’ the brand, GUESS is a street wardrobe staple. The men’s Rainbow T-Shirt is simple yet essential. Bringin’ a fresh look to your street style, it adds a pop of colour to keep things standout. With this Denim Jacket serving premium biker-inspired looks on the daily, this ‘fit upgrades your go-to style. They’re back and they’re better. Oh yes, Helly Hansen has returned from the archives and is bringing retro-inspired freshness to your street essentials. Not only a go-to for skiing, sailing and the streets, the ’90s saw Helly Hansen flowing into American Hip-Hop Culture. Keepin’ things clean, this Hooded Zip Through Jacket gets you layering up for the streets in statement style. Fresh and ready for anything, this versatile piece can be paired up with pretty much anything from the entire Helly Hansen collection. For true sneakerheads, switchin’ up the crep collection every season goes without saying. New to the scene, these Air Max 720 trainers land as this season’s must-have sneaker. Droppin’ fresh to JD with the largest Air Unit to date (38mm), the ever-evolving Air Max fam is always counted on to keep your street looks 10/10 from head to toe. Fresh and Fila, these Creator creps make a statement. Bringin’ premium retro edge to any ‘fit, these sneakers truly throw it back to the ’90s which couldn’t be more relevant this season. Upgrading your wardrobe and want the freshest? Make sure to always check out the latest and greatest here at JD!